Shah & Co Chartered Certified Accountants was established by Haren Shah, with his wife Sonal and help from his family in 1985. Starting in a small office with just a handful of clients, hard work and dedication built an enviable reputation for providing excellent advice and first-class service to business and personal clients alike. As the client base and staffing steadily grew, from recommendations and the incorporation of clients from Chatta & Co, the practice expanded into adjacent offices until they eventually occupied the whole of the first floor above the Coventry Building Society premises, in Station Street East, Foleshill. The transition in these years from accounts preparation on paper to a fully networked computerised accounts preparation was acknowledged by HMRC when 95% of Tax Returns were filed electronically, the year before it became compulsory. 2012 was the beginning of a new era for Shah & Co when Jay, Haren & Sonal’s son, joined the practice having trained in London and qualified as a Chartered Accountant. In the same year the opportunity to acquire the Cash’s Business Centre in Widdrington Road, meant the practice was re-located into much larger offices on the first floor of the newly refurbished premises. Allowing room for further expansion the practice soon became one of the largest family-run accountancy practices in Coventry. Expanding for the first time outside of Coventry Shah & Co in 2013, in collaboration with a former employee, acquired Pinnacle Accountants, the well-known Leicester firm of accountants that was first established in 1981. 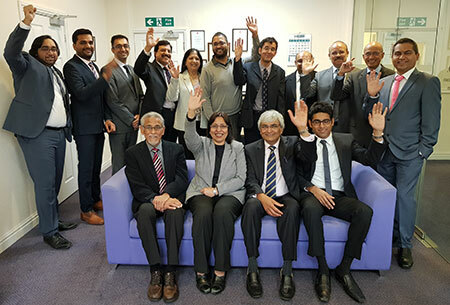 The Coventry office was further expanded in 2014 by the acquisition of Mistry & Co, Chartered Accountants, upon the retirement of owners Gulab and Gita Mistry, as their clients were incorporated into the practice. Looking to the future as HMRC move towards ‘Making Tax Digital’ Shah & Co being partnered with industry software giants IRIS, SAGE and ZERO are well placed to support their clients in the ever-expanding digital age. Watch this space…..
As well as general accountancy, audit and tax skills, all our partners also have individual specialist skills which enables us to provide clients with a first class service as and when required. With our wealth of experience we pride ourselves on delivering an unparalleled service to all clients, what ever their size or sector. "Our comprehensive range of financial and business support services and ongoing strategic advice has helped many of our clients to grow and develop their businesses over the years."